An old and very unusual Vermont Grossular. From the now classic Mt Belvidere (Eden Mills) locale, these Garnets are a rare light orange hue on pale translucent Diopsides. Most Diopside at this location is a deep green and the Garnets are typically more dark red. Collected over 80 years ago this likely came from a quarry area that simply no longer exists. Ex Warren Johannson collection collected in 1937. At this time the locality was not well known and the major finds were many years in the future. Some chips on a few edges but most of the specimen is intact with many perfect crystals. This habit and style is almost never available except in old collections. 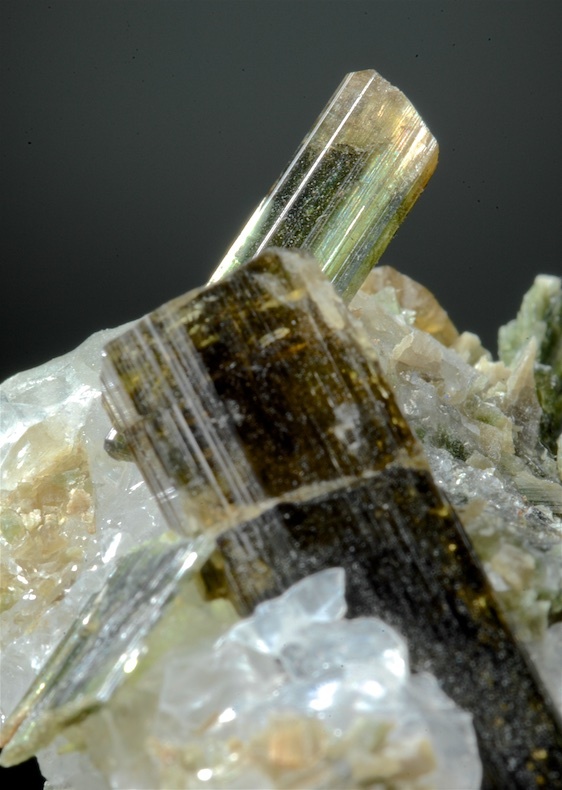 Sharp translucent Epidote/ Clinozoisite crystals to 2.1 CM well exposed from Calcite matrix. The main crystals are damage free, well terminated and have very good luster. C nice example from a classic locale, not many matrix specimens of Epidote were recovered. Could trim to thumbnail size if desired. 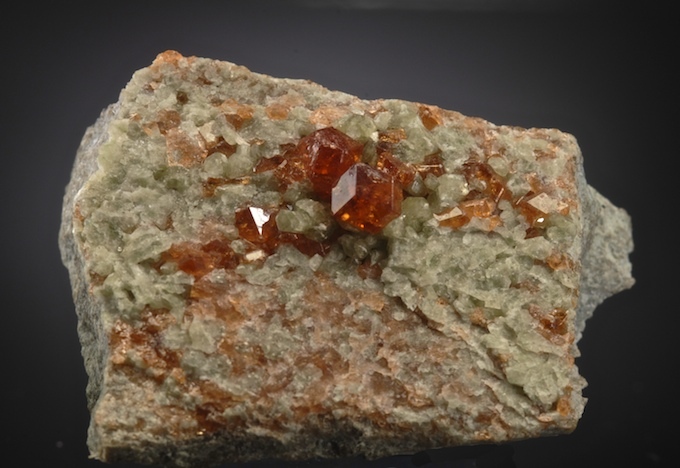 A classic style Belvidere mountain (Eden Mills) Garnet on Diopside and Calcite matrix. 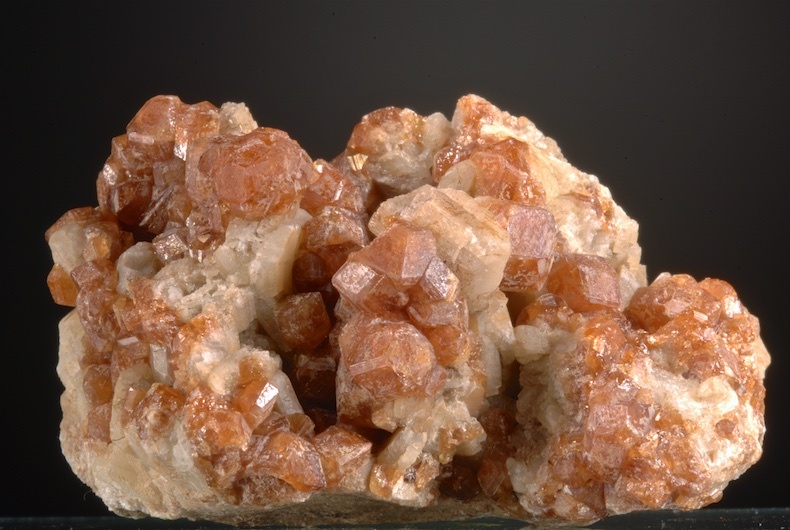 The main crystal is 1 cm across and sharp, glassy and a fine red-orange color. This long closed location is legendary for these Grossular which are now quite scarce in good quality piece. 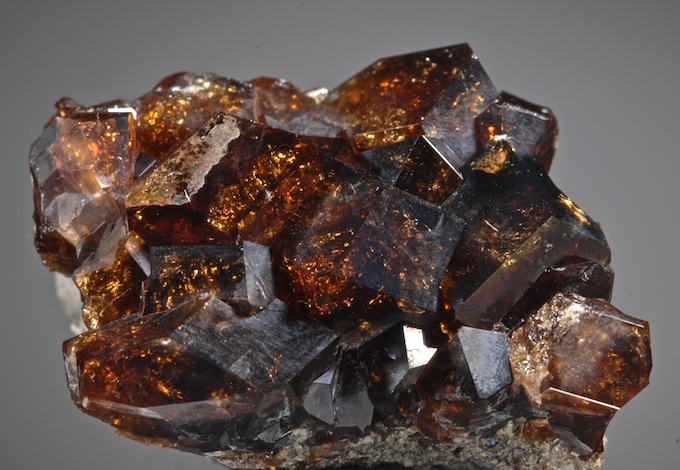 A few smaller Grossular and some remains of damaged crystals are also on the matrix, but the primary visual feature is the well exposed main crystal. Gemmy and choice. From what is commonly called Eden Mills, this is a very unusual combination. 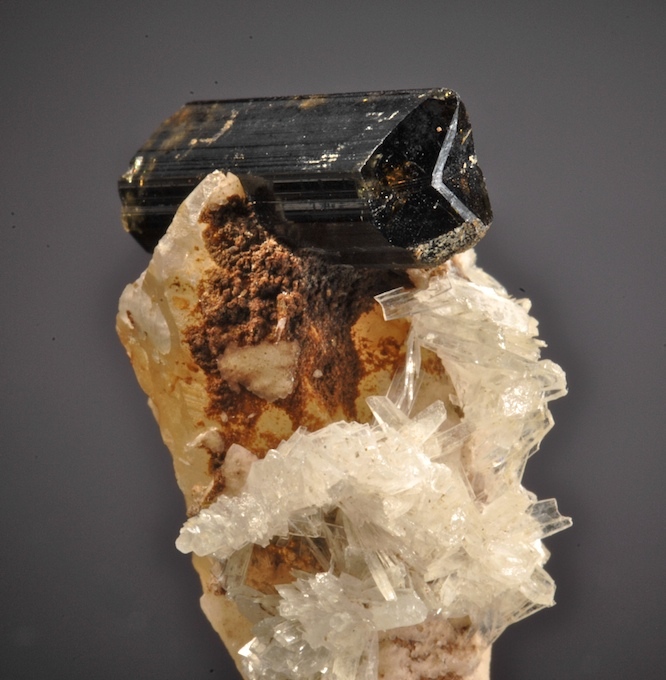 A single scalenohedron of Calcite hosts a lustrous Epidote crystal and sprays of clear Natrolite crystals as well. 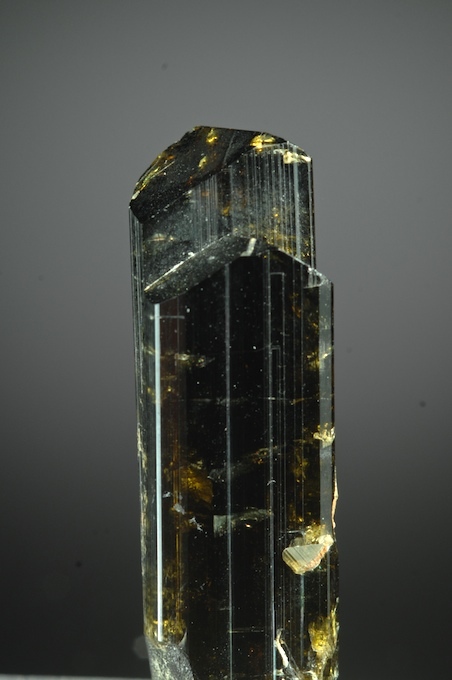 In good condition overall, the Epidote is broken on one end but fine otherwise, good magnifications reveals chipping on the Natrolites but is not naked-eye visible. Brilliant lustrous and in fine condition, this Epidote is a deep green to brownish- golden color, translucent and very sharp. The VAG mine has been closed for years and is a classic American locale. A particularly fine example from the heyday of collecting in the 1970s. Gemmy bright red garnets contrast with a minty green setting of small Diopside crystals. From the classic, long closed "Eden Mills" locality, these are now quite hard to find (and afford) in good quality. The Garnets (to 8mm) are well exposed and sit up from the matrix. This is not perfect, there are a few contacts, chips, rough spots etc best seen at 10x but the naked eye display quality is quite fine, and this is far less costly as a result. A superb gem Grossular Garnet from the legendary "Eden Mills" (Belvedere-Lowell) locale. Top color and clarity, this specimen hosts several brilliant Grossular with the rich deep red color that is so highly sought after. This could be trimmed to fine competitive thumbnail but to me it is fine as is. This level of quality was never common when the mine was working, these are now almost impossible to find. 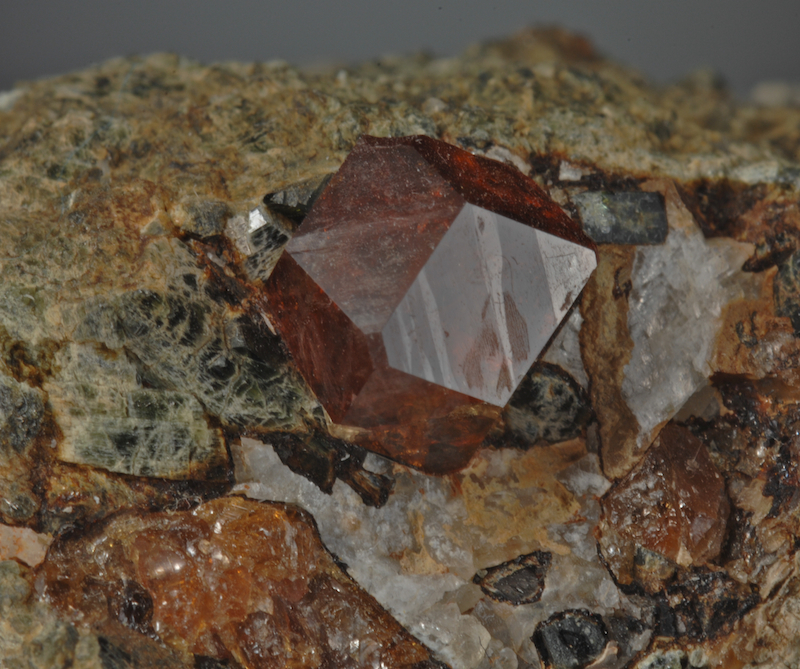 The largest garnet is 1.2 CM across and is pristine. 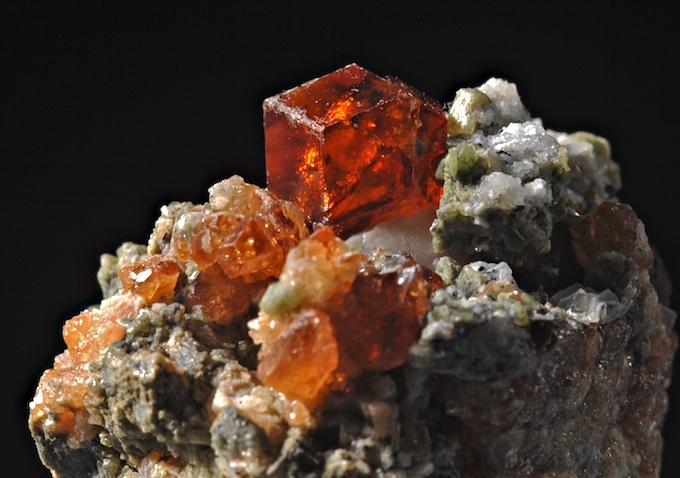 Other gem garnets on the specimen have inclusions or contacts from Diopside crystals that form most of the matrix. A very fine and choice specimen that is far more eyecatching than its size suggests.